Prp: They are hard to find. Very limited quantity in the world. Ralph Lauren don’t sell them anymore. Its hard to a pair of boots like these anymore. Very high quality. Handsome. Cons: Expensive. They are not tall enough. It use hook-and-loop straps instead of zippers for easy on and off. So the question for you guys is Should I keep these pair of boots or should I spend the money on a pair of Wesco boots or Dehner patrol boots? DAMN HE IS SO HOT IN THESE PAIR OF BOOTS! I had already returned them actually. Coz I have to return them within 30 days in order to get my full refund. Sorry. good luck on finding them somewhere else. For some time I see your blog every day and I love. Now ask me for a password to enter in the last post and in the comments… are her could provide me? If I were you I would go with a pair of Wescos. They are expensive but they are by far the best quality boot I have ever owned. The RLs I owned a few years ago were poor quality in comparison to even the cheap Justin workbooks I owned in college when I was working out on a ranch. I’ve owned Ariats, Tony Lamas, Chippewas, Justins, RLs, Corcorans, Magnums, Gripfast, and Wescos. The RLs I owned were by far the poorest quality boots I’ve ever owned. I own a pair of Wesco Jobmasters and they are the best boots I own, I liked them so much I ordered a pair of 16″ Wesco Harness boots from Stompers a week ago. If you are going to spend 500+ on a pair of boots, I would go with a pair of Wescos. If you like tall cowboy boots and don’t want to spend 500, I would look at Ariat and Tony Lama Buckaroo boots. I wear a pair of Tony Lamas Buckaroo boots everyday to work and they are very comfortable. I used to wear a pair of Ariats everyday and they are very comfortable as well. College bootboy, we should actually go there more often to check out some boots. They usually have a good boots collection. I have seen lots of Frye boots there. And add me on Facebook and we should keep in touch more. You still live in Seattle right? If I were you, I would have chose Dehner. Isaac, I think so too. I know they are really unique and they are hard to find. But I could get a pair of Dehner for less price with a better, taller look. I am thinking to get a pair of Dress instep patrol boots from Dehner if I am going to return them. Hey, firstly happy presidents day to you as well. 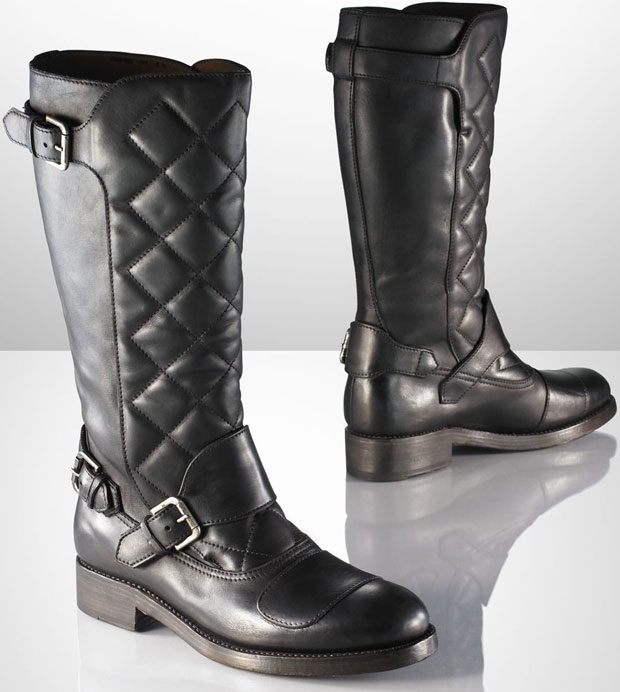 These RL boots have caught my interests for quite a while frankly, but still, i think it doesnt worth $500. I think your analyzation was pretty rational on this one considering the height is totally mediocre and you can put these money get a great pair of dehner or all american patrol boots with an absolut sharper look. The instep for these RL seriously disgusted me and i m def not big of them. Plus, the quilting craftsmanship on leather was created by COCO CHANEL in the very beginning, then Marc Jacob copied it, Ralph Lauren copied even after MJ did. So that would be def considered as a symbol of FEMININ. If you have a loosener budget i m def recommending you get a pair of KOENIG or CAVALLO. Thank you so much for your comment, Zack. Hope you had a great presidents day! You have good choice on a pair of boots then. Koenig and Cavallo are way more expensive than Ralph Lauren. I really like riding boots but they are just too hard to pull them off, so now I like wearing pull on motorcycle boots or lacing boots like Dr.martens 20 holes with zippers. Just fit more to an urban area. But thank you for your comment though.